We had to ask it. Everyone has favorites that jump out right away. Sometimes they stick around for life as favorites, but other times they will fade into the background as the album is toured and videos are released. A month after the release of the album there is one runaway favorite song. 26.7% of people asked to name a favorite picked “The Little Things That Give You Away”. The song is also one that we’ve known for longest as the band have performed the song in concert on the recent The Joshua Tree 2017 tour. People really seem to be enjoying it with it far out in the lead over other songs. 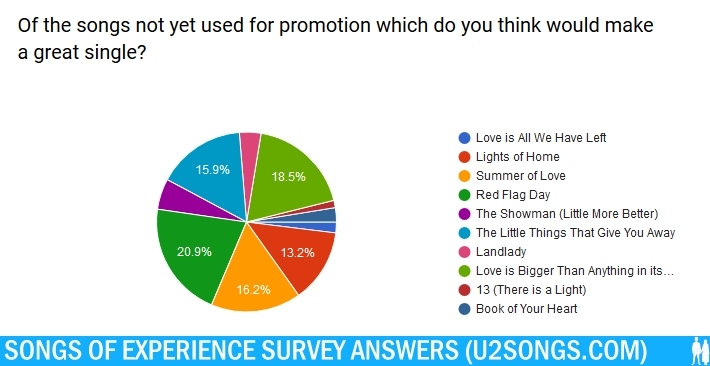 The next most popular song was “Love is Bigger Than Anything in It’s Way” at 14.6%, followed by “Lights of Home” at 9.9% of the respondents, and “Red Flag Day” at 9.4% of the respondents. Perhaps most surprisingly, none of the four songs used in promotion this far (“You’re The Best Thing About Me”, “Get Out of Your Own Way”, “American Soul” and “The Blackout”) were in the lead in list of favorites on the album. The first one of these songs to be listed as a favorite is the eighth song in the list, “The Blackout” which is listed with 5.2% of the vote. We also asked what was your least favorite track. Unlike the vote for the favorite track which had a clear out in front leader right from the start of answers being accepted, the least favorite track went back and forth between two different songs throughout the two week period. And they finished pretty close. 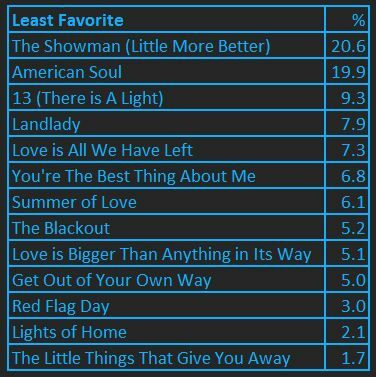 Overall “The Showman” was chosen by the most number of respondents as their least favorite track with 20.6% of the vote. Just behind that, at 19.9% of the vote is “American Soul”. “13 (There is a Light)” is the third track on the least favorite list with 9.3% of the vote. 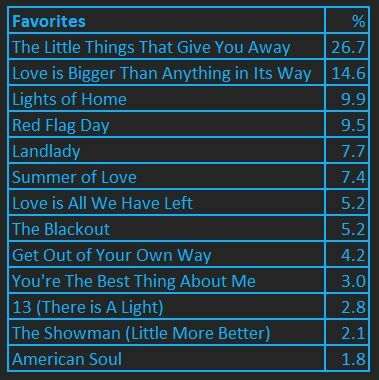 Not surprising, since it was a clear favorite, “The Little Things That Give You Away” is the lowest chosen song for least favorite with only 1.7% of respondents choosing that song. The deluxe album came with four additional tracks in most regions, these included two remixes of songs from the new album, one remix of an older song (“Ordinary Love”) and one unique new song (“Book of Your Heart”). The deluxe edition in Japan came with a fifth added track, a remix of “The Blackout” by Jacknife Lee, only released on vinyl elsewhere to date. It’s probably no surprise that the new song that doesn’t appear elsewhere took the lead here with 46.9% of you picking that as your favorite bonus track. The St. Peter’s String Version of “Lights of Home” got 25.5% of your votes, the Extraordinary Mix of “Ordinary Love” got 16.0% of your votes, and “You’re The Best Thing About Me” (U2 vs Kygo) got 7.4% of the votes. The remix of “The Blackout” which featured only on the Japan deluxe version, and vinyl single releases elsewhere comes in with 4.2% of the vote, but it is also the track which most people will not be familiar with. The reason we think “The Blackout (Jacknife Lee Remix)” did so poorly above is because of unfamiliarity is because of this question. When asked what peoples least favorite track was, 42.9% chose “You’re The Best Thing About Me” (U2 vs Kygo) as your least favorite of the five bonus tracks. “The Blackout” (Jacknife Lee Remix) only garners 20.6% of the vote. So far four different songs from the album have been used in promotion. “The Blackout” was up first as a Facebook only video, and later released to other services such as VEVO and iTunes. “You’re the Best Thing About Me” was the first single, with multiple versions of the song and video being released. “Get Out of Your Own Way” is the second single, with a remix released as a single, a video, and an edit sent to radio. “American Soul” was also sent to radio in Europe, and had a lyric video produced. We asked out of the four songs used for promotion so far, which was your favorite. At the time we were asking the questions, the animated video for “Get Out of Your Own Way” hadn’t yet been released, so the next question, what promotional video did you enjoy the most did not include that as an option. Users were given a choice between the lyric video for “You’re The Best Thing” (the books with lyrics inside), the U2 vs Kygo video (where we see Kygo performing a DJ set in a tropical setting, the New York video for “You’re The Best Thing” and the couples documentary for that song, as well as videos for “The Blackout” (Live in Amsterdam), “American Soul” (Lyric Video) and we allowed users to pick the Mexico City version of “Get Out of Your Own Way” as promotional clips in early December made it look likely it would be released. 42.8% of the votes for a favorite video went to the live version of “The Blackout” that launched the album campaign back in August. The video of U2 in New York for “You’re The Best Thing About Me” came in second among the choices with 26.7% of the vote. 9.2% of you chose the short clip of “Get Out of Your Own Way”, which placed it ahead of several finished clips in the poll. The remainder of the videos were as follows, “You’re the Best Thing About Me” (Lyric Video) at 8.6%, “American Soul (Lyric Video)” at 7.2%, “You’re the Best Thing About Me” (Couples Documentary) at 4.2% and “You’re the Best Thing About Me” (U2 vs Kygo) with the lowest number of choices at 1.0%. A few people asked us about some of these videos throughout the period the questions were open. We have a full list of videos by the band at the videos section of the site. What song not used for promotion to date make a great single? With the above four mentioned songs already used for promotion we asked what the remaining songs from the album would be your choice for the next single off of the album. A number of songs split the majority of the vote. Most users chose “Red Flag Day” at 20.9% of the votes. 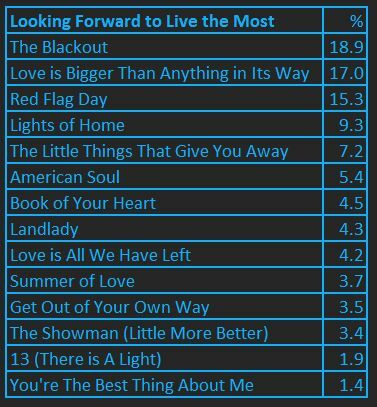 Four others songs had respectable results, 18.5% for “Love is Bigger Than Anything in its Way”, 16.2% for “Summer of Love”, 15.9% for “The Little Things That Give You Away” and 13.2% for “Lights of Home”. 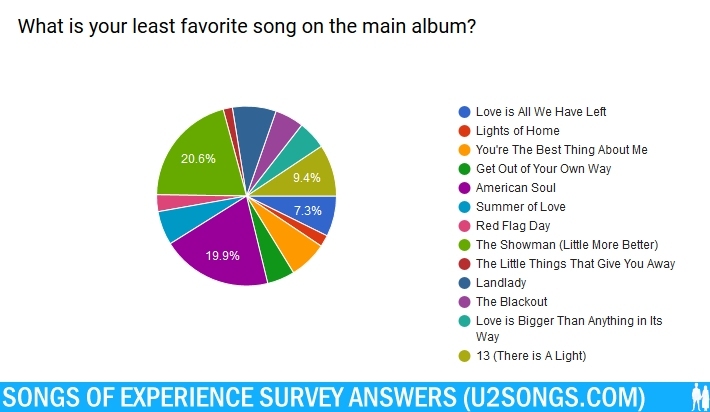 This was an interesting question as many users chose “The Little Things That Give You Away” as a favorite song on the album, but when asked what would make a good single, “Red Flag Day” comes out ahead. What songs didn’t do as well? “The Showman” came in with 5.5%, “Landlady” came in with 3.9%, “Book of Your Heart” came in at 2.6%, “Love is All We Have Left” at 1.9%, and “13 (There is a Light)” had the least number of votes, with 1.3%. What would make a great opening song on tour? We all love to discuss set lists and what we would like to hear live. We wanted to ask a few things about your thoughts on what might work for this upcoming tour. The first question we asked was “what song would be a perfect opener for a concert?” In this category “The Blackout” was the runaway. 40.9% of people responded that “The Blackout” would be perfect for an opener. 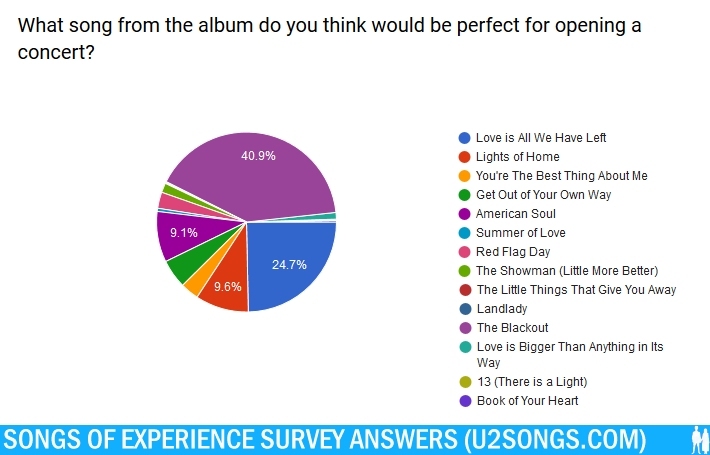 24.7% chose “Love is All We Have Left” as a perfect opener and 9.6% chose “Lights of Home” as the perfect opener. What song didn’t get many votes? “Book of Your Heart”, “The Little Things That Give You Away”, “Landlady” and “Summer of Love” all got less than 1% of the vote. What song would be the perfect song to close a concert? It appears that heavier songs are the popular ones when suggesting a song to open the show? What about for closing a concert? We asked if there was a song on Songs of Experience you thought would be the perfect song to close the concert. 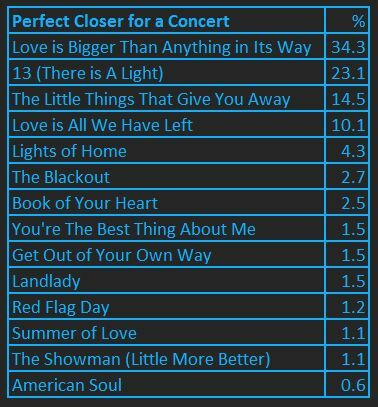 The clear winner here is “Love is Bigger Than Anything in Its Way” chosen by 34.2% of you as the perfect song to close things. Perhaps many of you were inspired by the television broadcast of “Live At the BBC” where this song was performed with a full orchestra and closed the program in a spectacular performance. The next most popular answer was “13 (There is a Light)”. The opening song on the album was chosen as the second answer in the question about what song you would like to see open the shows, and the closing song of the album was chosen as the second answer in the question about what song you would like to see closing. Placement on the album may influence our decision on where we think things should fit in concert. 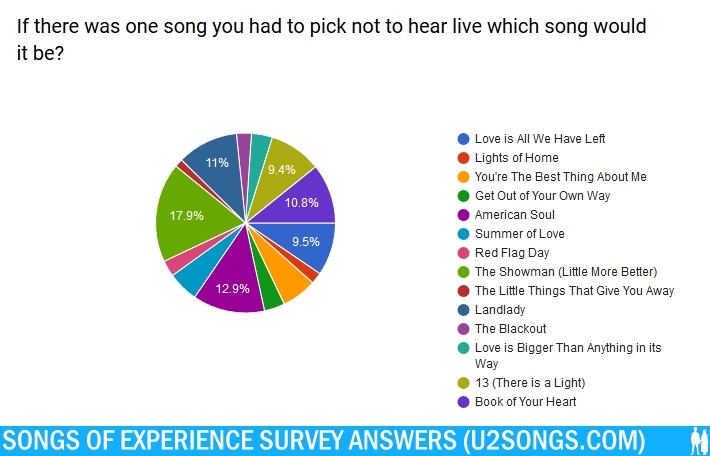 The third most popular answer was “The Little Things That Give You Away” a song that many of us saw close concerts on The Joshua Tree 2017 tour. What song do you look forward to hearing live the most? What one song do you want to hear above all others this tour from the new album? This one was interesting as we didn’t get the same answers as what was your favorite song. Even though a song may be someones favorite it doesn’t mean its the one song people want to hear live. 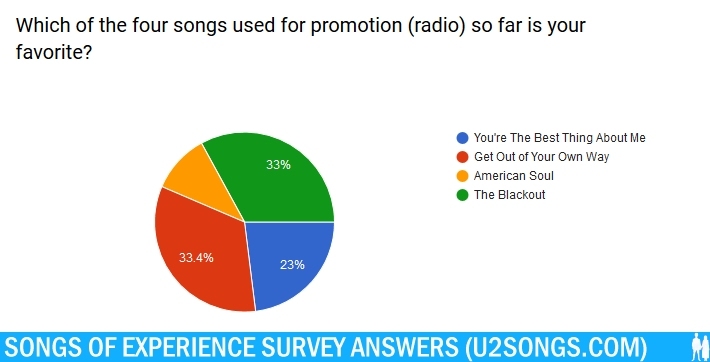 The song with the most votes for the one song people had to hear live was “The Blackout” with 18.9% of the survey respondents choosing that song. A close second? “Love is Bigger Than Anything in Its Way” with 17% voting for that song. People are also hoping to hear “Red Flag Day” with 15.4% of the vote. What songs didn’t fare well in this question? Very few of you listed “You’re the Best Thing About Me” (1.4%) or “13 (There is a Light)” (1.9%) as songs you looked most forward to hearing live. 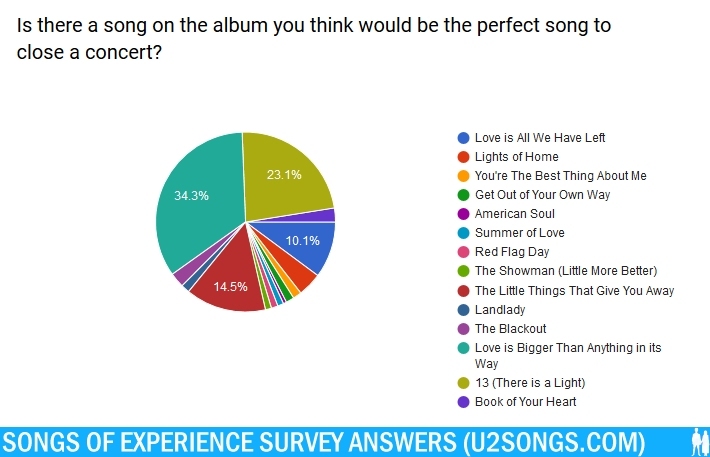 Those two songs gained the least amount of the vote, with bonus track “Book of Your Heart”, not even on the main album, coming in with a 4.5% of the responses. If you had to pick one song not to hear live what would it be? This was the one question no one wanted to answer. We got several comments on Facebook and Twitter about how people wanted to hear every song on the album. But we asked you “If you had to pick one song not to hear in concert what would it be?” The answer that the most respondents chose was “The Showman (Little More Better)”. 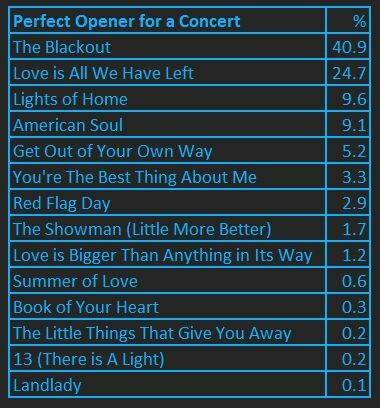 17.9% when faced with picking a song they had to leave out of the upcoming concerts chose “The Showman”. 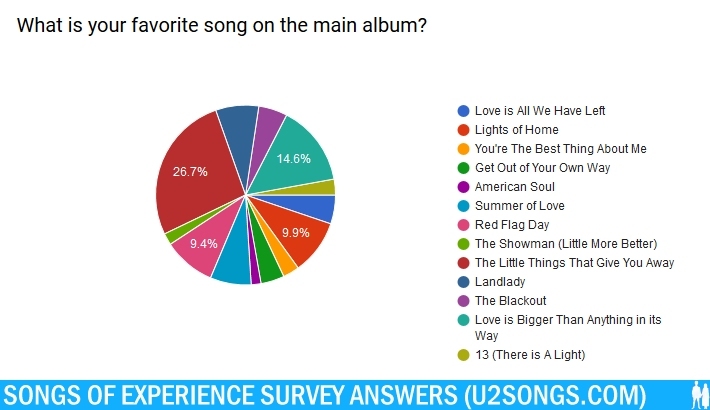 Perhaps it shouldn’t be a surprise, as when asked what the least favorite track on the album was 20.6% had chosen “The Showman” making it the most chosen song in that category. But in that category “American Soul” had 19.9% of the vote, so as least favorite songs they were close. 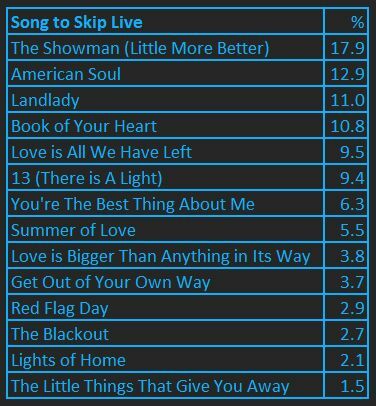 But when asking what song people wouldn’t want to hear, “The Showman” comes in at 17.9%, and “American Soul” while still second, came in at 12.9% of the answers, so the difference between the two songs is larger here. “The Showman” you don’t like, and don’t want to hear it live. “American Soul” gets a bit of a break when it comes to hearing it live. Third in the answers was “Landlady” at 11.1% of the answers. 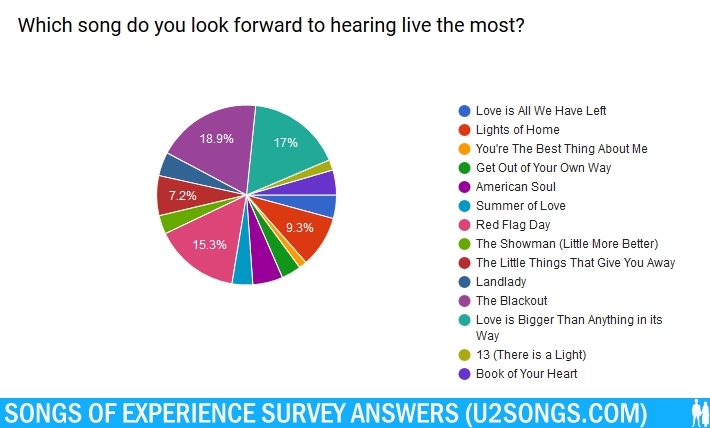 Both “The Little Things That Give You Away” (1.5%) and “Lights of Home” (2.1%) got very few votes in this category, although neither song was among the top vote getters in the songs you had to hear live. What is your favorite version of “You’re The Best Thing About Me”? Finally we asked some questions about the two songs that have been most pushed as singles, with a variety of different mixes available. First up was the first single from the album, “You’re The Best Thing About Me” and we asked what version of the song was your favorite. There were four choices given, the single mix / album version, The Sci-Fi Soul Mix which was a remix done by Jacknife Lee which was used for promotion at radio, The Acoustic version which was released for sale at digital store fronts and streaming services, and the U2 vs Kygo Version which was released as a bonus track on the album. The clear favorite was the album / single mix at 63.2% of the vote. The next most favored was The Acoustic version with 16.6% of the vote, followed by the U2 vs Kygo version at 11.8% of the vote. The version least chosen was the Sci-Fi Soul Mix, at just 8.4% of the vote, but many commented on Facebook and Twitter that you had not even heard this version of the song. What is your favorite version of “Get Out of Your Own Way”? The other song that has had a variety of mixes released was “Get Out of Your Own Way” and while the survey was running three versions were available, the version from the album, a radio edit without Kendrick Lamar, and a remix called “The Switch Remix”. Another remix has since been commercially launched, “The Afrojack Remix” but that song was not available while these questions were actively accepting answers. Your favorite choice here again was the version from the album with 71% of the votes. The radio edit which removes Kendrick Lamar’s voice at the end and has a shorter fade in garnered 27.5% of the vote. And the Switch Remix even got some votes, 1.5% of you chose that as your favorite version of the song. We were surprised anyone would pick that version, but we did have votes for it. The other half of the questions you answered dealt with the albums themselves. How it compares to other albums, how you have been enjoying it, and so on. Those answers are available as well, and can be accessed in Part One of this article. Again we would like to take the time to thank everyone who took the time to answer our questions. It was very much appreciated. We invite you to discuss these answers with us and other fans via Facebook, Twitter, and in our forum.